Cody Custer started riding bulls at 13 years old and won Arizona high school championships in 1983 and 1984 before joining the PRCA in 1985. 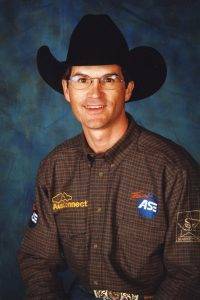 He qualified for the National Finals Rodeo every year from 1987 through 1992, when he won the world championship. One of his most-memorable rides was in Round 10 of the 1991 NFR, when he scored 94 points on Growney Brothers’ Wolfman. His previous high score had been 90 points on Skoal Pacific Bell at the 1988 Grand National Rodeo in San Francisco. Custer was the Turquoise Circuit Bull Riding Champion from 1989-92, the Dodge National Circuit Finals Rodeo Bull Riding Champion from 1990-92, and the Original Coors Rodeo Showdown Bull Riding Champion in 1992. Custer bounced back from a series of injuries following his 1992 gold buckle season to qualify for the NFR in 1998-99. He also won the Cheyenne (Wyo.) Frontier Days bull riding in 1999 and remained an active bull rider through 2002. In addition to his success in the arena, Custer rode for Hollywood – as a stand-in for Lane Frost’s character in the movie 8 Seconds. At the time of his induction into the ProRodeo Hall of Fame in 2017, he was still active in rodeo and helped conduct rodeo classes for aspiring pros.